Far-left U.K. parliament member Jeremy Corbyn, who has a history of anti-Israel rhetoric and a controversial association with a group run by a Holocaust denier, has been elected overwhelmingly as the new leader of his country’s opposition Labour Party. British MP Jeremy Corbyn has been elected as the new leader of the Labour party. Credit: Wikimedia Commons. The 66-year-old Corbyn, who won nearly 60 percent of the ballot in the first round and became the clear victor over three other Labour ministers, is known for his denunciations of the Israel Defense Forces, and his reference to the terror groups Hamas and Hezbollah as “friends.” Corbyn has in the past also offered to host representatives of the two terror groups in the British Parliament. 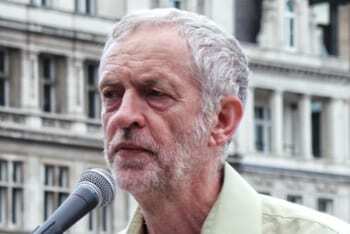 In an interview with the anti-Israel website Electronic Intifada in August, Corbyn expressed support for imposing an arms embargo on Israel and boycotting Israeli universities involved in arms research. “I think we have to push robustly for the limitation of arms supplies [to Israel],” Corbyn said. Corbyn has called this allegation “ludicrous and wrong,” and claimed he did not know about Eisen’s views about the Holocaust when he attended a few DYR meetings some years ago, according to the Guardian. “I think to bring about a peace process, you have to talk to people with whom you may profoundly disagree,” he said. A recent Jewish Chronicle poll showed that seven in 10 British Jews were concerned about Corbyn becoming the Labour leader. These concerns are “not at all exaggerated” and “held by a very, very wide consensus of the (British Jewish) community,” Arkush said. “The New Israel Fund” in Australia is also active in undermining Israel’s interests. NIF’s anti-Israel propaganda activities, moreover, provide ammunition to the variegated antisemitic anti-Zionist elements in the West. Coincidentally, but appropriately,”The New Israel” is the title that supersessionist Christians have given themselves, arguing that since the advent of Christianity, the Jews have lost all rights to any part of The Land of Israel. After the Victory of WW2 with the Holocaust of six million Jews and Five million Gentiles and millions of civilians the British Labour under” Bevin-Belsen” blocked Holocaust Survivors returning to the ancient homeland now a sanctuary for Jews . British Labour led by Bevin the Foreign minister Rejected the recommendation of the UN at the time to allow 100,000 Holocaust survivors into British Mandated Palestine as a Humanitarian Compassion .The Legacy of British labour was callous and with its now leader and his Shoah Denial Allies -it has revived with a repugnance . There has been some support for Corbyn from some representatives of toxic Jewish anti-Israel groups notably of the New Israel Fund (NIF). It is indeed very telling that representatives of both Hamas and the NIF have endorsed the new Labor leader in the UK, Jeremy Corbyn. Prior to his election as Labor leader, polls showed about 80% of UK Jews as concerned or very concerned about the possibility of Corbyn as Labor’s leader. He is on the record supporting an arms embargo against Israel, supporting the boycott of goods from Judea and Samaria, supporting the “right of return” of Palestinians and has referred to Hamas and Hezbollah as friends. Earlier this year he spoke at rallies supporting Gaza. Then there is Rhea Wolfson, who serves as Communications and Outreach Manager for NIF in the UK who also likes Corbyn. Wolfson says Corbyn “offers something different,” commenting that his “straight talk” has swayed her. On June 28 she updated her Facebook page with a “Jeremy Corbyn for Leader” slogan. Wolfson is featured on the NIF UK website prominently. So it seems that in endorsing a left-wing socialist with vehemently anti-Israel policies, representatives of Hamas and NIF have found common ground and are birds of a feather.